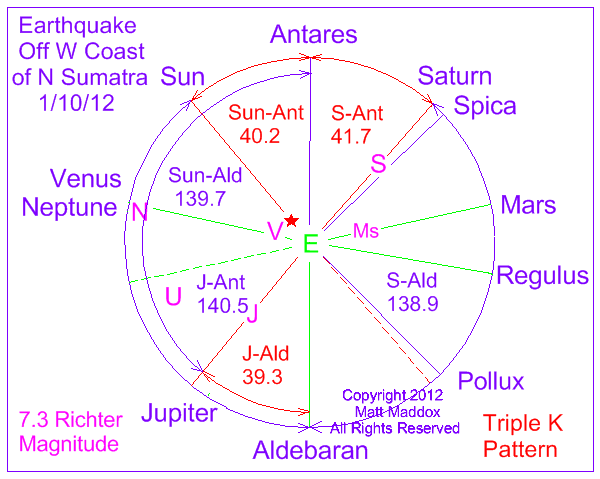 Note the tetrad of axes composed of Saturn-Antares, Moon-Venus, Mercury-Jupiter, and Pollux. 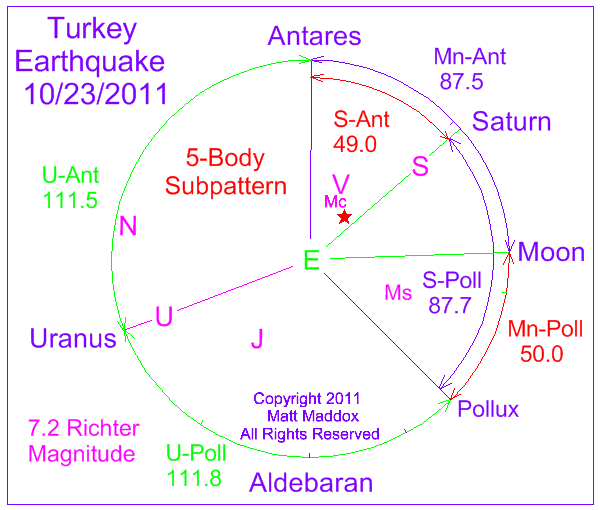 A triad or tetrad including Antares and Pollux is commonly found with earthquakes. 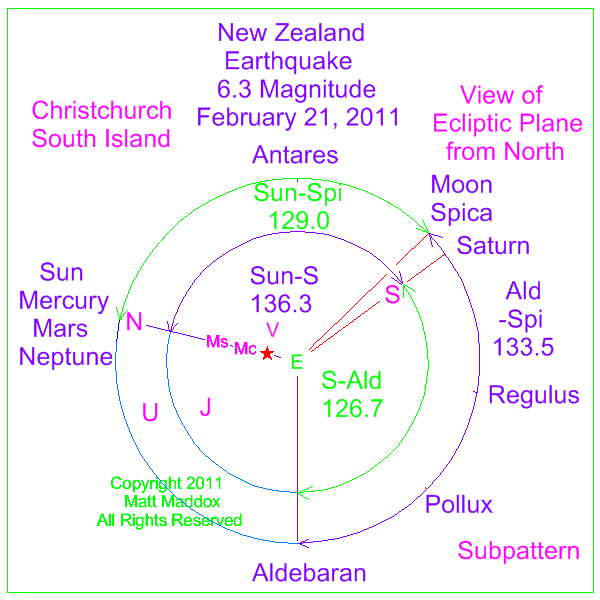 The Sun and Neptune are directly opposite each other and at right angles to the Antares-Aldebaran axis. This earthquake was felt in seven states and appears to be associated with fracking disposal wells. Thirty-seven wells out of 3200 active disposal wells were shut down as a result of this earthquake. Note the adjacent repeat angles of ~105-107 degrees associated with this event. Also, please observe that there were three different alignments occurring at this time. note the perfect saturn-uranus symmetry with pollux in constellation gemini. 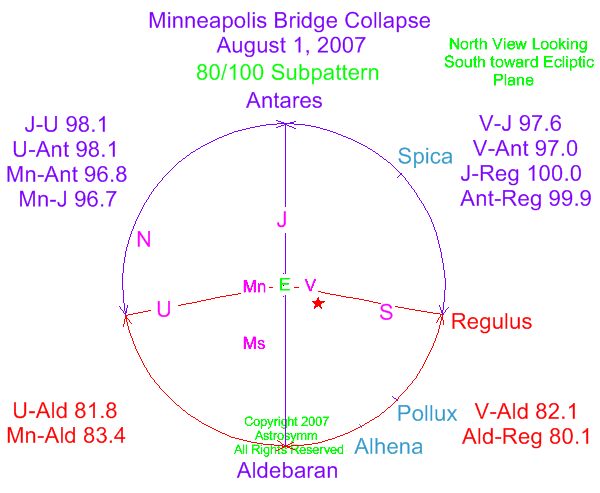 symmetry with pollux often results in geologic events. please see volcanoes page for numerous examples including krakatoa and kuwae. 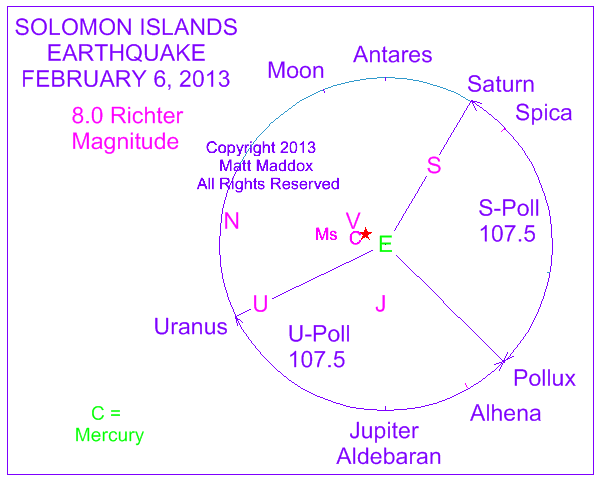 a 7.0 magnitude earthquake was predicted for february 6, 2013 at 1700 utc. this 8.0 m earthquake struck at 01:12 utc - a difference of only 16 hours! there were several other subpatterns which contributed to this quake. note the augmentation of the basic mayan fall 2012 pattern. 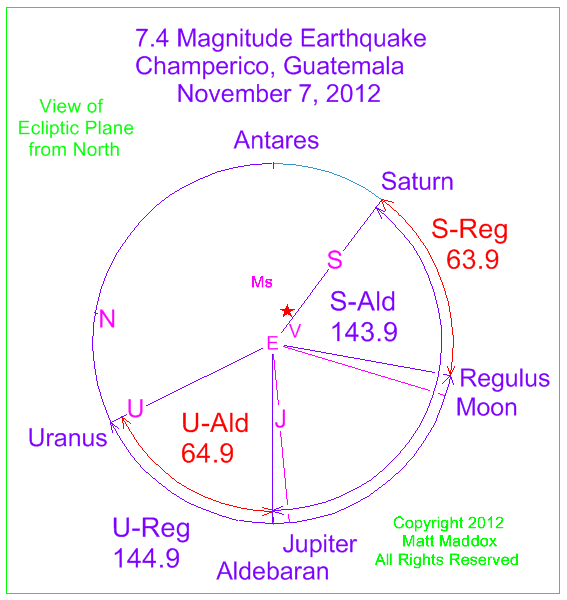 the moon and jupiter positions add two axes to the mayan pattern to result in a sextet of axes! 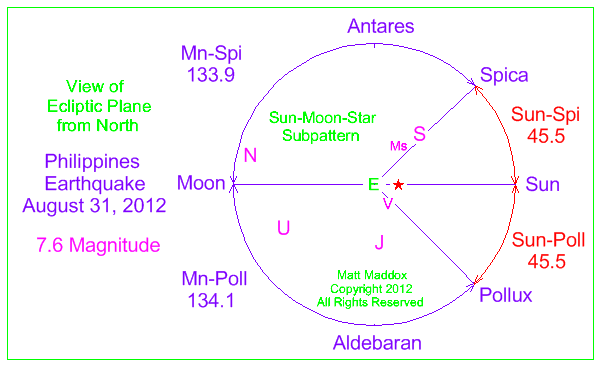 the basic mayan astronomical pattern is in place for fall 2012. it consists of a symmetric tetrad - group of four axes - composed of 1) uranus, 2) aldebaran opposite antares, 3) regulus opposite neptune and 4) saturn. 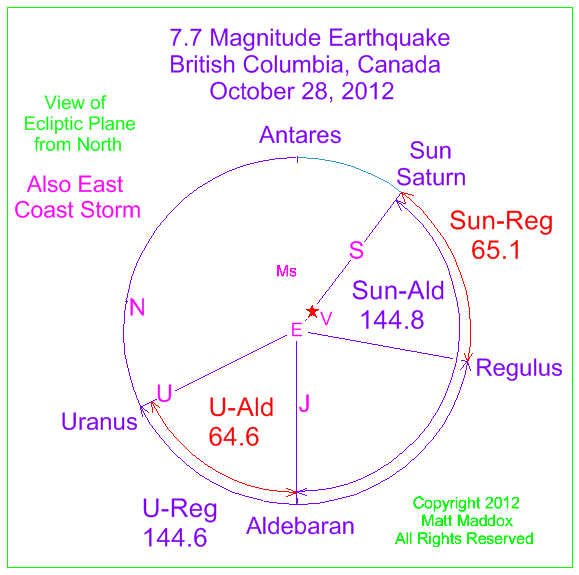 for hurricane sandy and the british columbia earthquake, the sun is aligned with saturn, reinforcing that axis. please access the mayan page to see the similarity with the solar-view or heliocentric pattern for the december prediction date. the timing, but not location, was predicted for this earthquake. the prediction time was 1400 utc on aug 31, 2012. the event time was 1247 utc - just over one hour difference! note the precise sun-spica and sun-pollux angular separation match of 45.5 degrees each. 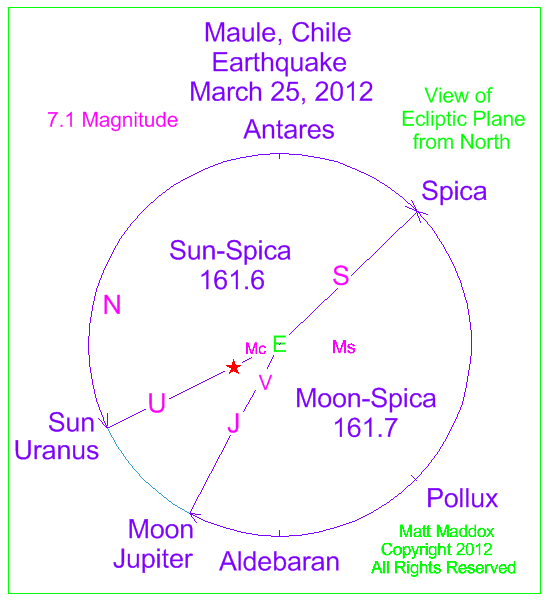 in addition the moon-spica angle was 133.9 and the moon-pollux angle was 134.1 degrees - also a very close match! 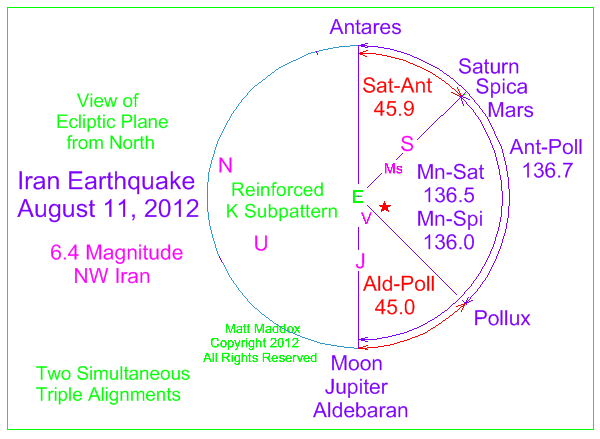 note the two simultaneous triple alignments associated with this shallow and potent earthquake in the middle east. a second shock came only 11 minutes later. the alignments reinforced the already symmetric k pattern within the ecliptic plane. an earthquake was predicted somewhere globally for this date for 0600 utc. the actual event was 1223 utc on 8/11. 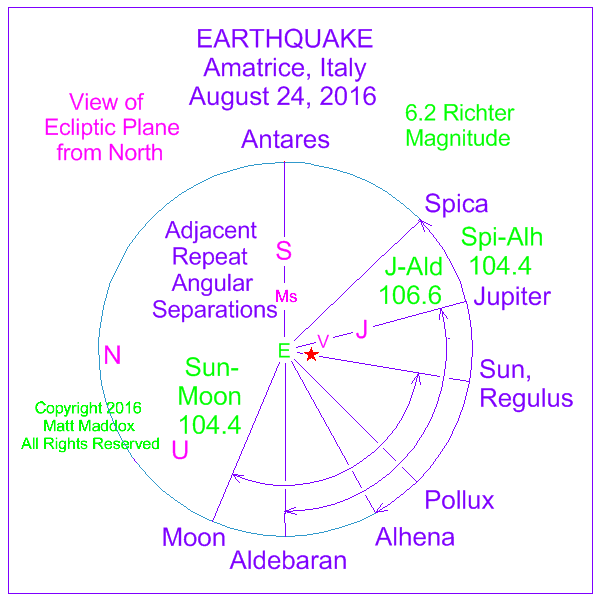 although it is not immediately obvious, there are four simultaneous alignments associated with this large magnitude event. going counterclockwise, the alignments are moon- center of galaxy, neptune-e-mars-regulus, sun-e-saturn-spica and aldebaran-venus-e-antares. saturn and venus reinforce the ever-present stellar k made of antares, spica, pollux and aldebaran. saturn is positioned to complete an almost perfect symmetry with antares, pollux and aldebaran. 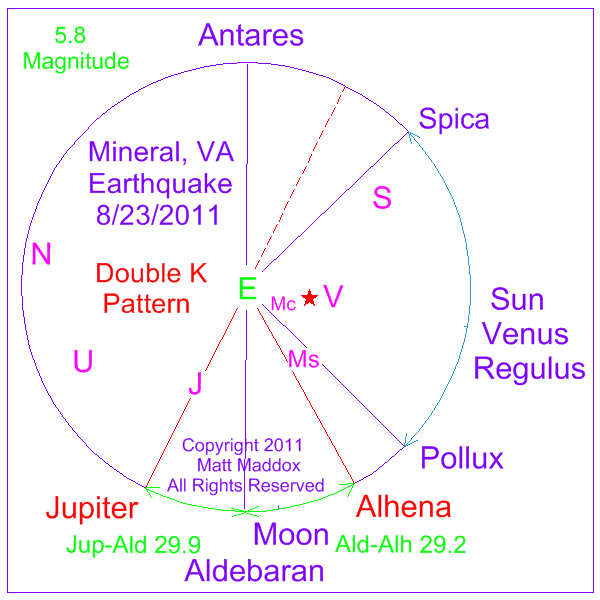 note the symmetric relationships between 3 alignment pairs - saturn-spica, sun-uranus and moon-jupiter. it's important to know that symmetric patterns associated with geophysical events quite often enhance the pre-existent stellar ecliptic k-pattern composed of antares, aldebaran, spica and pollux. there is more symmetry than that shown. the venus-antares angle is 161.7 degrees and the aldebaran-center of galaxy angle is ~162.5 degrees. please compare this antares-pollux tetrad with the subpatterns for the mars dust devil of february 16, 2012 and the huntsville, alabama tornado of march 2, 2012 on the tornado page. note the jupiter-saturn opposition for this event. 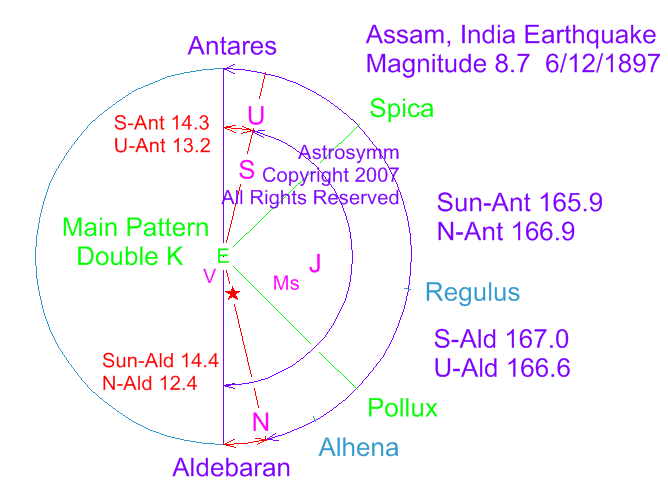 also, relative to the antares-aldebaran backbone, the sun is symmetrically opposite both jupiter and saturn! this subpattern was anticipated and a 7.0 magnitude earthquake was predicted somewhere globally for january 9, 2012.
this earthquake was within about 600 miles of the northern bay of bengal - one of three predicted areas for 2012! 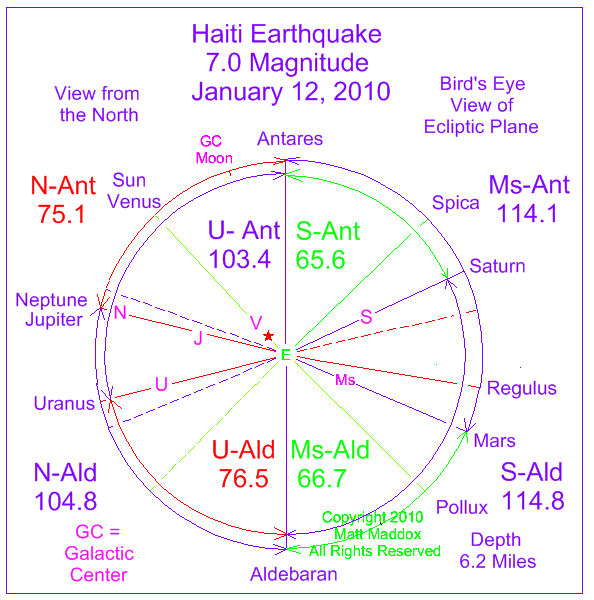 january 14, 2012 note- this event plus other earthquakes around sumatra, nicobar islands, andaman islands and especially myanmar are considered prelude to an 8.0+ event in the n bay of bengal in 2012-2013.
in 1757 there was a 7.5 magnitude sumatra earthquake followed in 1762 by a n bay of bengal 5.5 ft tsunami. this sequence is predicted to recur at about a 250-year interval. please note the moon-saturn-antares-pollux tetrad associated with this event. 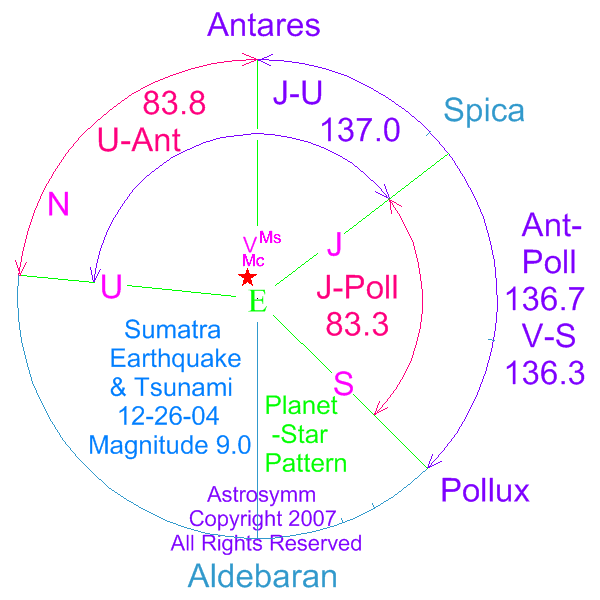 there is also a uranus-antares-pollux triad which happens to be symmetric with the tetrad. this overall combination produces a moon-2 planet-2 star pentad, which, coupled with other symmetries not shown, resulted in a large magnitude geologic outcome. please scroll further down the page for two more examples of moon-saturn-2 star tetrads associated with large events - the 1960 & 2010 chile great earthquakes! note the double k subpattern when the jupiter-earth line is extrapolated. 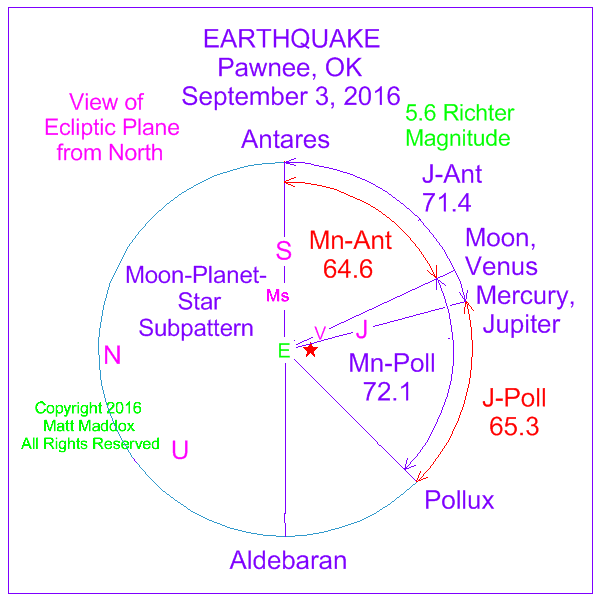 for the 1897 virginia earthquake, the moon is six degrees closer to aldebaran, but still in the same region of the sky! also, for the may 31, 1897 event, jupiter was in the same approximate position as venus was for the 2011 event- within 1.3 degrees! in addition to the obvious symmetric subpatterns shown above, venus, at 80.1 degrees from aldebaran and 99.7 degrees from antares exhibits a near-perfect mirror-image relationship with regulus! regulus is 80.1 degrees from aldebaran and 99.9 degrees from antares! 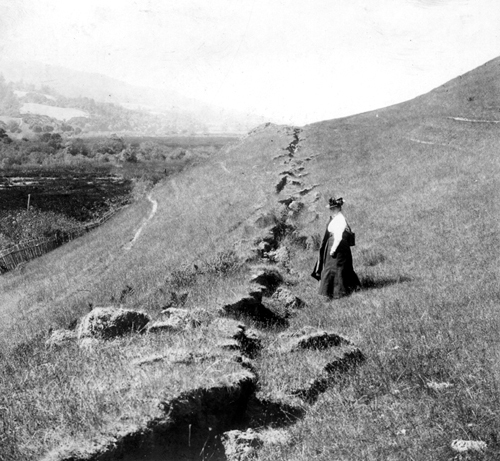 this was the most massive earthquake in the 20th century! 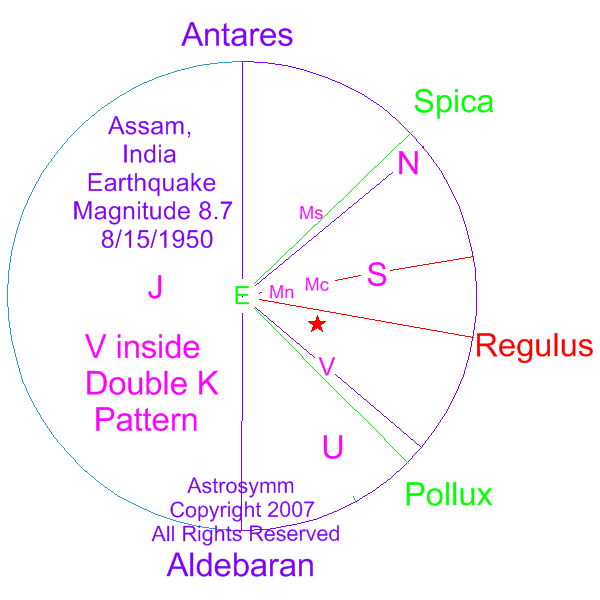 note the clear symmetric patterns with respect to the antares/aldebaran backbone. 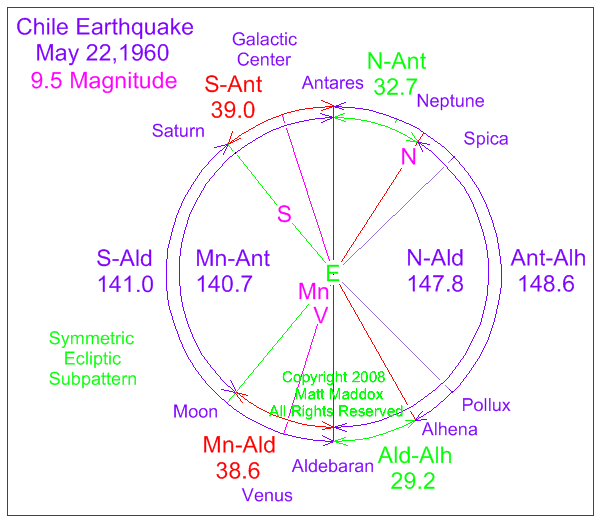 for both the 1960 and 2010 earthquakes, note the moon positioned symmetrically opposite saturn in relation to the aa backbone. here is the usgs site (1) for statistics on this powerful event. 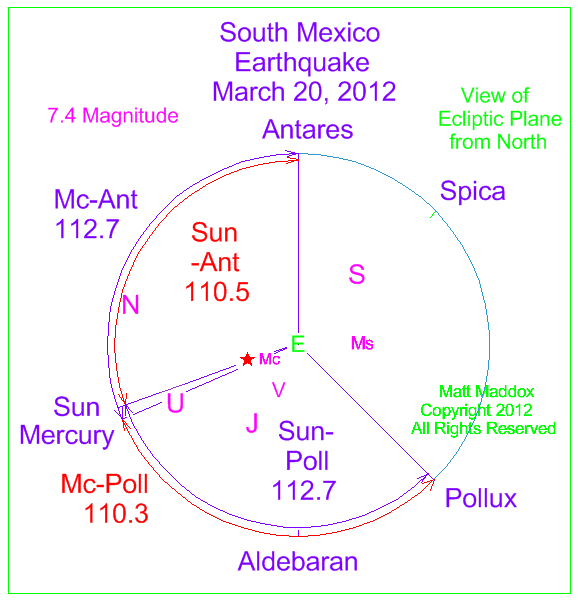 1) the sun-venus alignment (venus in superior position) opposite pollux. 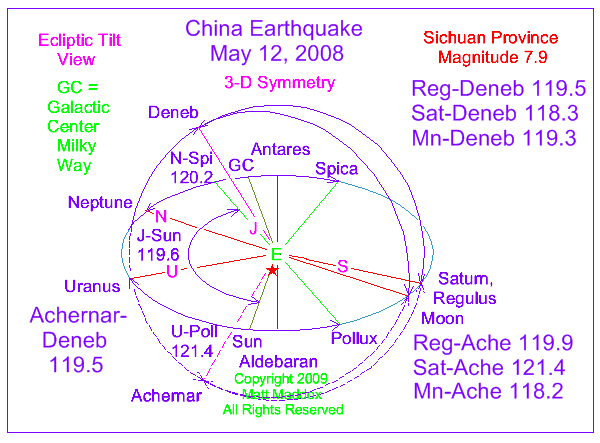 this alignment creates an extension of the stellar ecliptic k pattern. 2) mars and saturn are about 66 and 114 degrees from the antares-aldebaran backbone of the k. they are symmetrically opposite each other in space. 3) the jupiter/neptune alignment is symmetrically opposite uranus. 4) uranus is symmetrically opposite regulus. 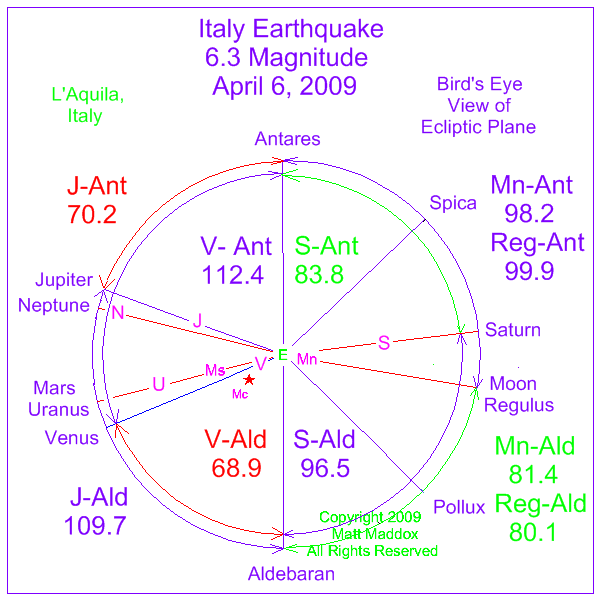 note the similarities to the pattern of the l'aquila, italy earthquake of 2009 shown immediately below. in 1976 a major earthquake hit tangshan, china. 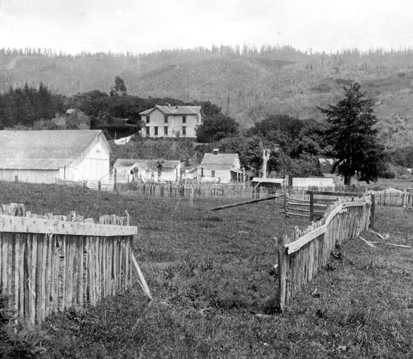 although part of an overall pattern, a distinct subpattern occurred on that date. 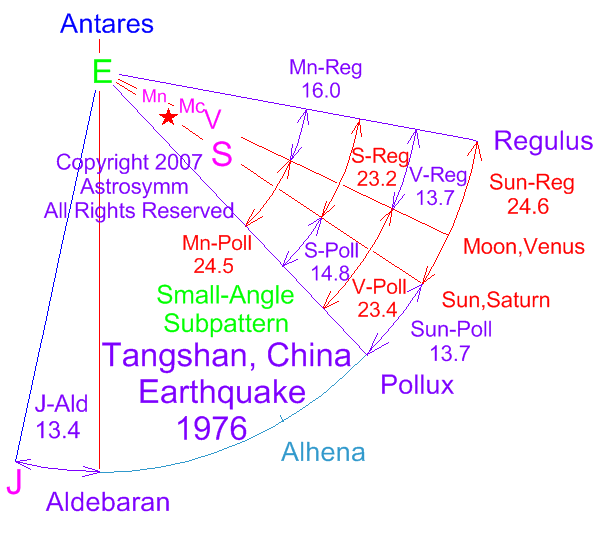 the moon-venus and sun-saturn axes exactly split the earth-regulus and earth-pollux axes. note the repeat numbers in the range of approximately 14-16 degrees and also 23-25 degrees. for 3-d diagrams see chelyabinsk, tomsk-7, three-mile island in nuclear, columbia in shuttle and super tuesday 2008 tornadoes in tornadoes. Note the obvious X pattern associated with this powerful event. The Sun and Uranus axes are mirror images to the K pattern established by Spica and Pollux with Antares and Aldebaran as the backbone. 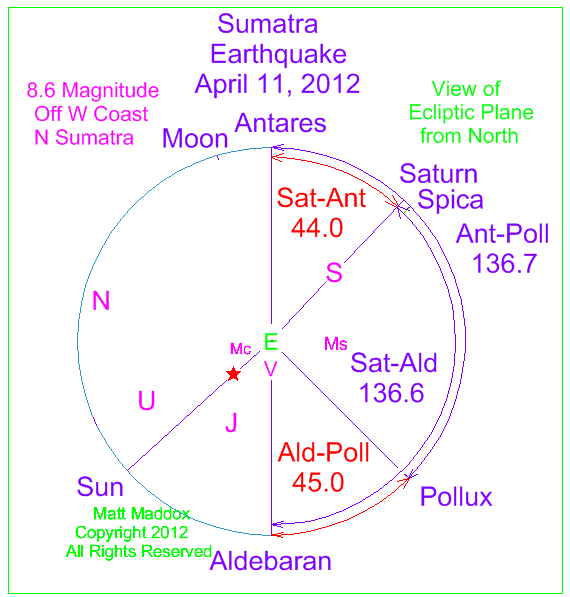 in the first sumatra event, saturn lined up with pollux, and mercury and venus were close to antares. jupiter and uranus were at just the right positions to complete a very neat symmetric pattern. in the second sumatra event the large planets were still in approximately the same positions. due to the relative motions of earth and neptune, neptune was now symmetric with spica and aldebaran. 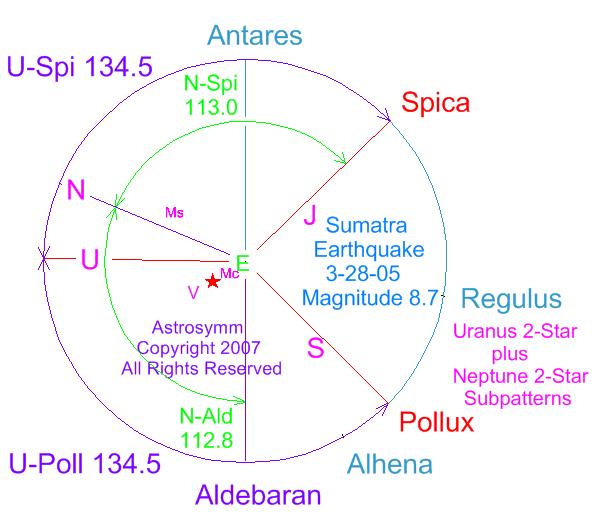 uranus was, at the time of the second quake, perfectly symmetric with respect to spica and pollux! this diagram is one subpattern for this event. Note the clear double K pattern associated with this awesome event. Some estimates relate 200,000 fatalities with this disaster. Large numbers of people were living in caves carved out of loess - deposits of wind-blown silt which are loosely compacted. The caves collapsed during the earthquake. The long-term angular separation of Antares-Regulus is 99.9 degrees. The angle for Aldebaran-Regulus is 80.1 degrees. 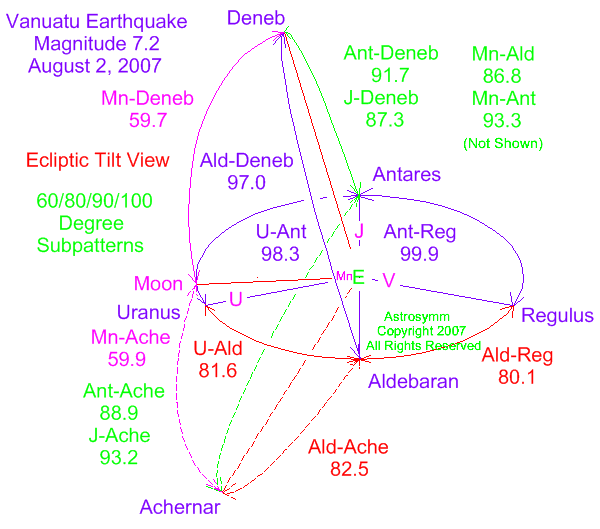 So the Jupiter-Regulus-Antares-Aldebaran symmetric agreement is very close. at certain altitudes in the earth's upper atmosphere the temperature increases relative to the surface. the same happens in the sun's corona. in the solar corona the temperature can reach 2 million degrees k. it is proposed that plus and minus gravity create shear forces in both these environments to heat any molecules that are present. the molecules would constantly be accelerated up and then down and then up again. 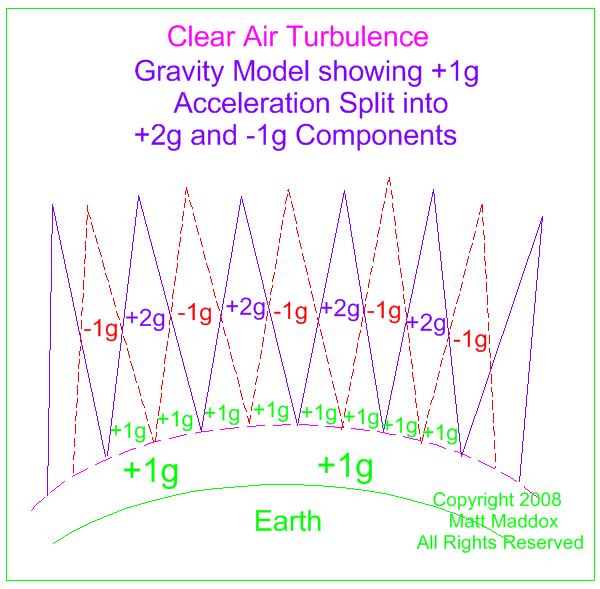 the cones of plus gravity and cones of minus gravity usually would nicely overlap at the surface of the body resulting in cool temperatures relative to the core or upper atmosphere/corona. at the points where they separate, the dual nature of gravity would be revealed. 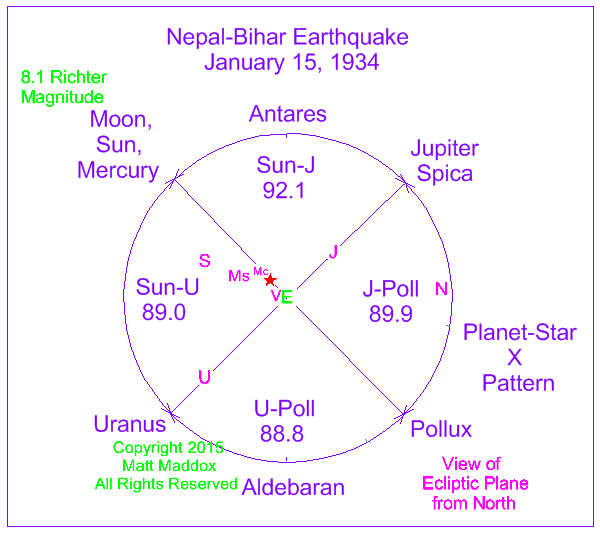 for this extreme india earthquake, note the saturn-uranus and sun-neptune axes which are symmetric with both the antares-aldebaran axis and the earth-spica and earth-pollux axes! this is another “double k” associated with a major earthquake. 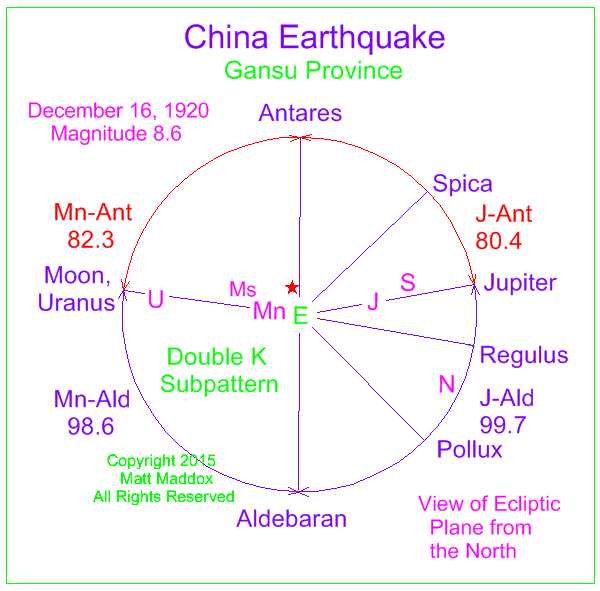 for this major earthquake, the long-term k is augmented by a v-shape and another k. the v-shape is composed of the earth-moon-mercury-saturn axis and the earth-regulus axis. this v-shape does not include venus. the second k is composed of the earth-neptune and earth-venus axes. please compare the papua pattern with the 1933 sanriku, japan earthquake diagram below. note the approximate 80 and 100 degree angles within the ecliptic plane as shown in this diagram. for this event, there were 4 axes which impinged on the earth: moon-aldebaran, jupiter-antares, venus-saturn-regulus and aldebaran. generally, the planets move through the sky relatively slowly, so the moon was the final piece in the puzzle, moving symmetrically opposite venus for this event. note the complex three-dimensional structure for this event. using approximate numbers, purple shows 100 degree angles, red shows 80 degrees, green shows 90 and pink shows 60 degree angles. 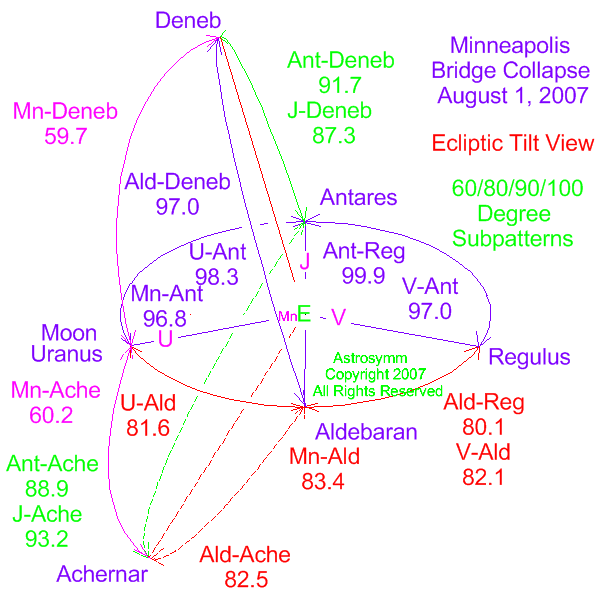 the moon shows closely matching angles with two powerful stars within the ecliptic plane - achernar and deneb. the forces associated with earthquakes were at work with this event- there was a 7.2 magnitude earthquake in the pacific just 6 hours before! 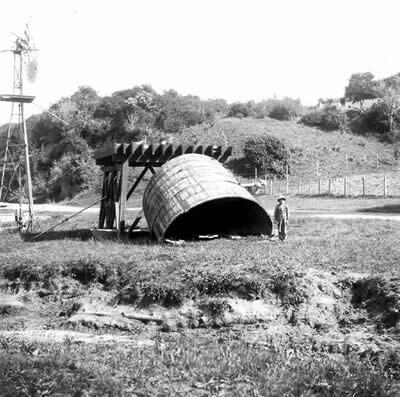 there were gravitational shear forces at work with adjacent and opposite gravity forces applied to the bridge. 1) 100 degree angular separations in the ecliptic plane and outside the ecliptic. 2) 80 degree angular separations in and outside the ecliptic. 3) 90 degree angular separations of jupiter and antares with stars outside the ecliptic plane. the moon shows these angles within the ecliptic. 4) 60 degree moon-star symmetric angles outside the ecliptic. these angles match nicely at 59.7 and 59.9 degrees! the combination of symmetries resulted in shear forces within the crust. 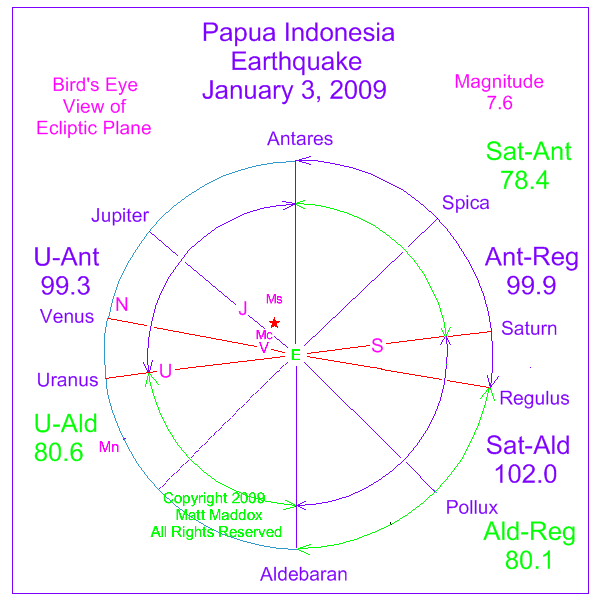 the large planet/star pattern for the indonesia earthquake series of 9/12-13/2007 is almost identical with the java earthquake of 8/8/07 as seen in the 80/100 subpattern below. the large planets just don't move much in a one month period. the other objects move faster. note the three-dimensional aspect of the sun-star angles. on an annual basis on august 6th, the sun is about 116 degrees from antares. 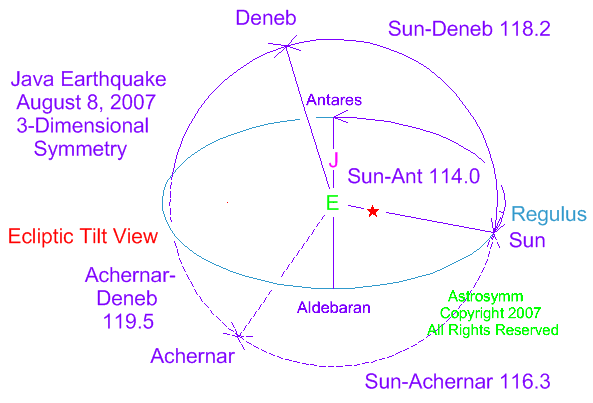 on this day the 3-d angles to energetic stars achernar and deneb outside the sun-earth or ecliptic plane are about the same! on august the 8th, there are still sun-star angles which match quite closely- symmetric angles at approximately 114, 116 and 118 degrees! please observe that the sun was on this same axis but at an opposite point in the sky for the columbia accident. that position also set up three-dimensional symmetries but with complementary angles - about 63-64 degrees for the sun-star angles! 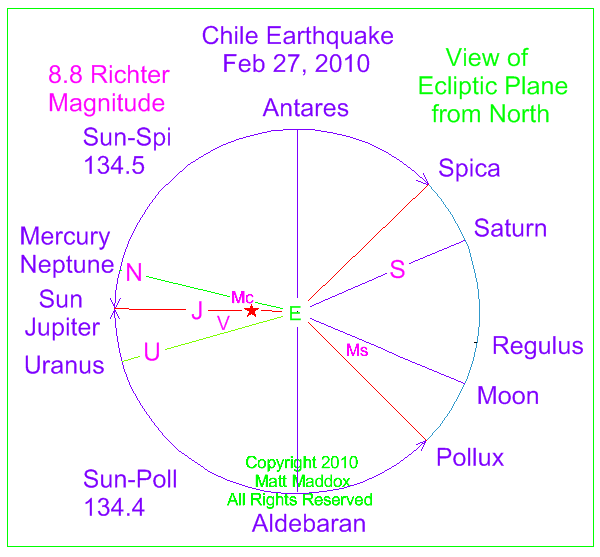 there are four axes involved within the ecliptic or sun-earth plane for this earthquake: 1) aldebaran, 2) uranus, 3) jupiter-antares and 4) venus-saturn-regulus. 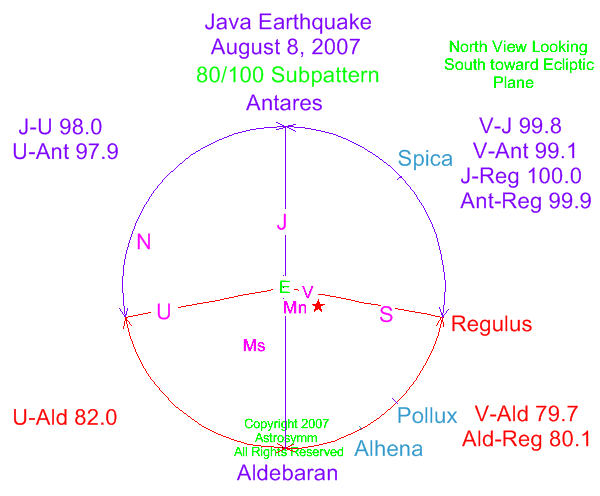 the angles of approximately 80 and 100 degrees match the long-standing angle of powerful regulus with energetic antares of 99.9.
an earthquake was included in the august 6, 2007 (plus or minus 3 days) predictive window on the predictions page. don't miss the distinct double k pattern for hurricane katrina! see the amazing <<14/24 reciprocal pattern>> for the 1976 tangshan, china earthquake and the unmistakable geometric pattern for the 1995 kobe, japan earthquake below.